Build your events brand exposure by encouraging your guests to tweet. Engage your guests with interactivity! Social Media is playing a key role in the events of today, and when utilised properly can sky-rocket your event’s exposure to new heights. One way to encourage your delegates to embrace your online social presence is to include an interactive twitter wall at your next event. Add a new level of interactivity by allowing your delegates to tweet directly to the screen, and have their pictures or tweets displayed live. Of course the possibilities don’t stop here. A properly implemented twitter wall can save you a lot of hassle in the long run also, by welcoming feedback via twitter, session Q&A’s and even competitions. 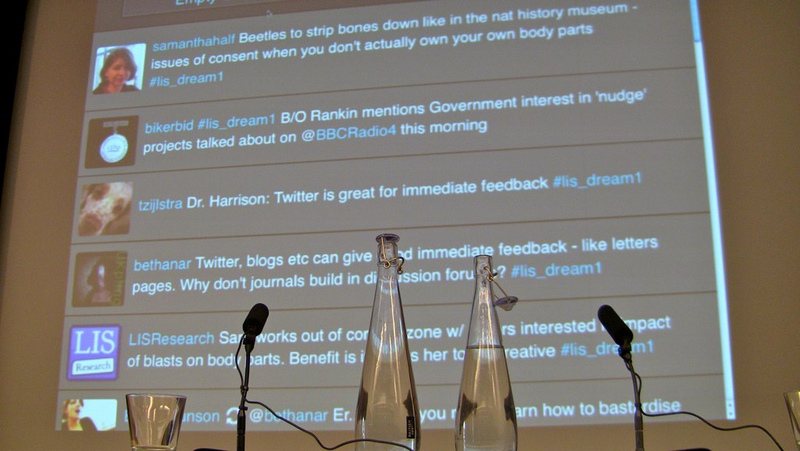 When you hire an interactive twitter wall from Stage Bright, you can be sure that you are receiving a complete package. Our twitter wall kit ships with a dedicated Apple Mac Mini, to ensure uninterrupted operation, and a dedicated support technician for the set-up process of your event. Furthermore, our twitter walls can be completely branded to match your corporate branding and identity. As well as supplying the technical infrastructure for your twitter wall, we can also arrange to supply large LCD screens, projectors and even LED Walls to display your twitter wall on. These can be delivered directly to your venue and set-up prior to the event, ensuring everything is ready to go. We do not limit ourselves to one product or service. Stage Bright prides itself on offering a diverse range of services, tailored to the needs of our clients. We can completely tailor a package to suit you. All of our products and services are tested prior to arriving on site, and sent with a dedicated, experienced technician for set-up. We believe in quality. We also believe in fair pricing. We regularly check our pricing against our competitors to ensure that we remain competitive while still maintaining a high level of quality and service. We are always open to hear offers that you have received from other companies, and maintain an open mind regarding pricing. Whenever you hire a product or service from Stage Bright, you can be sure that it has been set-up, checked and installed by a competent, professional event technician. This is for your piece of mind, to ensure that the most crucial bits of your show remain in good working order. We have a dedicated support team standing by to solve any problems that you may have on site. Hiring an interactive twitter wall from Stage Bright is an incredibly effective way of adding a new level of interactivity to your next event. Wherever your event is located, whether it be Southampton, Bournemouth, Winchester, Romsey, Basingstoke or even further afield, you can be sure that we’ll be there to help you out. at Stage Bright we know what it takes to host a successful event. By combining our extensive experience with our diverse database of suppliers and freelancers, you can be assured that your event is in safe hands. Implementing the Stage Bright service is easy. It all starts by taking the first step of getting in touch, and discussing your goals, vision and any preliminary ideas for your event. From here, we set the wheels in motion to get your ideas collated and an event proposal put forward. Whether you are simply using one of our event elements, or if you are looking to us to completely oversee the production of your event we can get set this up for you. In addition to our modular ‘Event Elements’, we are also able to work completely white-label for your company, offering our services and experience as an unbranded service. This allows you to quickly and easily re brand our service, allowing us to work harmoniously with your in house design, marketing or events team. By adopting this modular approach, we are able to very easily adapt and scale our service to meet the needs and requirements of a multitude of events. We can literally have as much or as little involvement in your, or your clients’, event as you wish. We pride ourselves on our diverse range of skills and services that we are able to provide, whether you are looking to hire a lighting desk, get some 3D CAD renders drawn up for your event or even have us completely look after the technical production of your event – we are able to accommodate that.